The Anna Perenna non-wire comfortable fit bra by White Label Lingerie. No wired in a panelled power mesh with sheer through the breast and back, finished with an ultra minimal elastic '' fine ans strong''. This stunning modern bra as adjustable strap with gold metal trimmings and sliders with a single front closure. This Bra is MADE TO ORDER, allow Us 2 weeks to produce it. If your measurement is different, please provide your's and I will cut it for you. For Sizing over 38 D, there will be 15$ extra charge. Power mesh knit, strong and soft! Under bust (Inches): 32= 27 - 29"	/ 34= 30 - 32"	/ 36= 33 - 34"
PLEASE SEE HOW TO MEASURE ON PICTURES AS WELL. If you have doubts, please contact me and i'll help you. 1-	Put on your best-fitting non padded bra. 2-	Wrap a measuring tape snugly around your rib cage, just beneath your bust line. 3-	Adjust the tape so that it’s parallel to the floor. 4-	Exhale deeply, you want the smallest measurement possible. 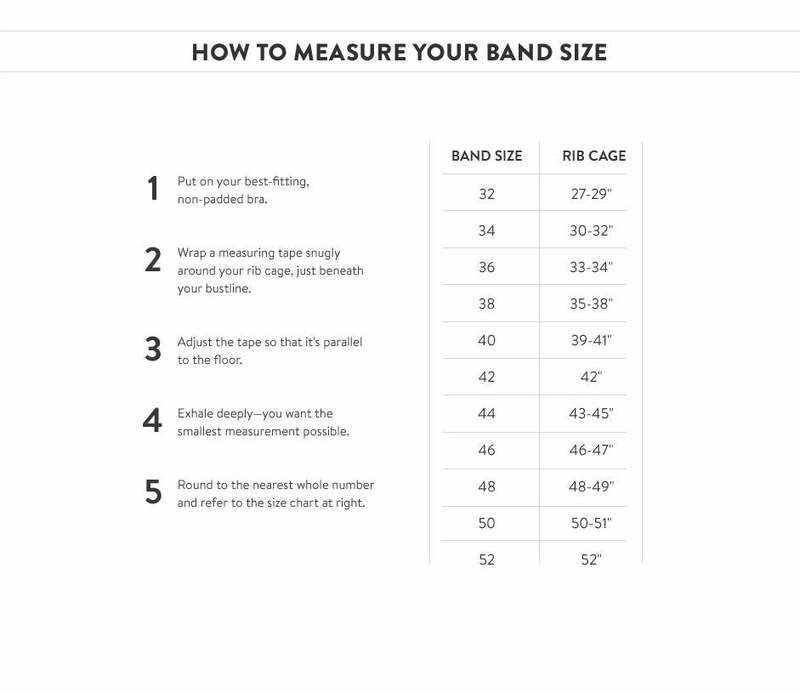 5-	Round to the nearest whole number and refer to the size chart at right. + If your sizes is different, please contact me and i'll gladly cut one for you! + Bra can be exchange if the wrong sizing or fitting.